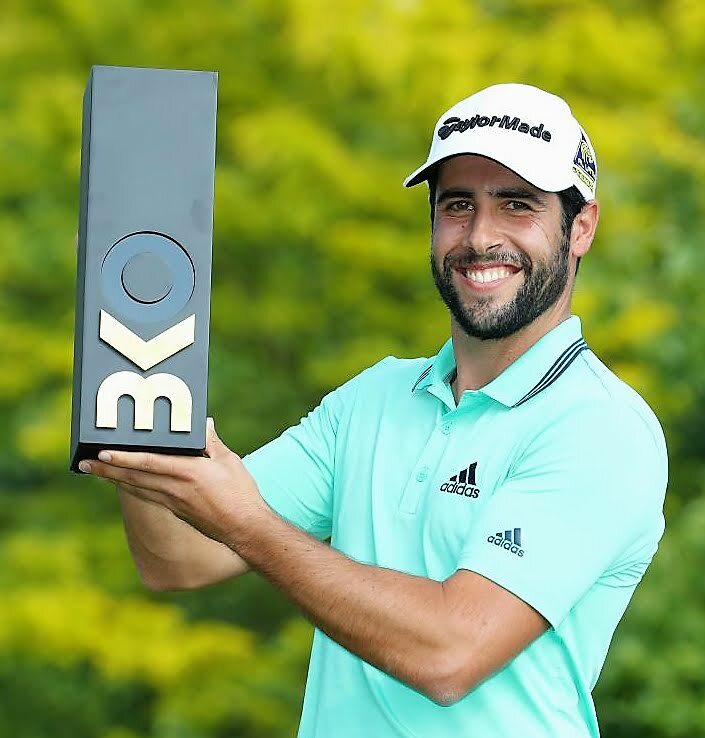 Spain's Adrian Otaegui beat Benjamin Hebert of France by two shots in the final of the Belgian Knock-out European Tour competition today (Sunday) to claim his second European Tour title at Rinkven International Golf Club, Antwerp. The innovative format was played over 90 holes, with 36 holes of stroke play on Thursday and Friday cutting the field from 144 to 64. This was followed by six rounds of nine-hole knock-out stroke-play to determine a winner. Otaegui, pictured right, and Hebert both finished three shots off the lead at five under after two days and battled through the next five matches, with huge crowds lining the fairways as host Thomas Pieters brought the European Tour back to Belgium for the first time in 18 years. Hebert edged ahead first in the final but Otaegui hit the front on the sixth as a hat-trick of birdies guided him to three under and a second win in head-to-head competition. Otaegui earned 166,660 euros; Hebert 111,110 euros. David Drysdale, pictured above right, finished third after beating Englishman James Heath by one shot in the 3rd/4th play-off. That win earned the Scot 62,600 euros. Heath's reward was 50,000 euros. Otaegui, motivated by an increasing prospect of a Ryder Cup team place in Paris, arrived in Antwerp as one the form players on Tour and secured a sixth consecutive top-20 finish on Saturday afternoon before going on to follow up last season's maiden victory at the Saltire Energy Paul Lawrie Match Play. Both players went to the right off the tee on the first to surrender bogeys but Hebert bounced back on the second, rolling in a left-to-righter from 15 feet for a birdie and the lead. In the third/fourth place play-off, Heath took the early initiative with a birdie on the second but Drysdale hit back on the third. Both men made a mess of the fifth but Drysdale dropped one shot to Heath's two and that would prove crucial over the sprint distance of nine holes. The contest was level with a Heath birdie on the next but Drysdale made a gain on the seventh and the duo parred the last two holes.